…i was 12 years old, and I insisted…”I WANT TO PLAY THE DRUMS!!! …so my dad bought me a trumpet? Anyway, soon after I was booked in for lessons with a man called Sam Sharp. He was a terrific trumpet teacher. A bit of a task master, but a great player who inspired me to have a good go at this trumpet playing lark. and there was a spare Eupho up for grabs. I loved it. the English Style Brass Band, and the brass band repertoire. I have been hooked ever since. That was 1985, and I’m still here. Even though most people don’t actually know what a Baritone is, when the first Baritone seat became available in 1991 I grabbed it. First Baritone in a brass band is a great spot. It’s mostly a unique part, with a few solo’s here and there. There’s more than enough to do without sweating it too much. under our current Musical Director Dr Alan Lourens ). I started playing trumpet in year 6 through the school of instrumental program. 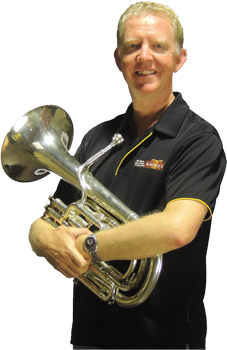 I played in many bands including the WA Primary schools band, Combined Schools Brass ensemble , Northern Districts concert Band (Now combined Districts Concert band) and any School ensemble I could. After 5 years on Trumpet I made the change to EEb Tuba. An early highlight was the trip to the USA to play at Disneyland California. 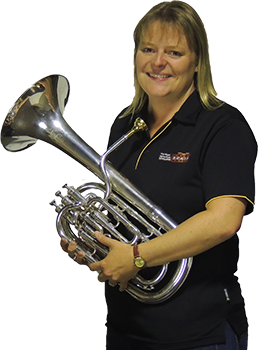 In 1991 I joined Midland brick Brass whilst still playing with Combined Districts and have been a member ever since with the exception of short leaves to have my 3 children and a country teaching post. I have since played both tenor horn and baritone in the band and am currently playing Baritone. More recent highlights for me have been the 2013 Nationals and the 1st Singapore tour. Now I enjoy juggling my 3 school aged children and their interests, my teaching career and my own musical interests.